This goes on in our house at least once a day. Note the abundance of dog toys. We live in a pug day care I swear. But we wouldn’t have it any other way. I can attest to it…It is scary when they fight! It is like somethingout of animal planet! Hooray! Nothing makes me happier than seeing puggie cuteness! And we never get to see pictures of Kiki, Mollypants & Zoe anymore!! And Lisa is right. 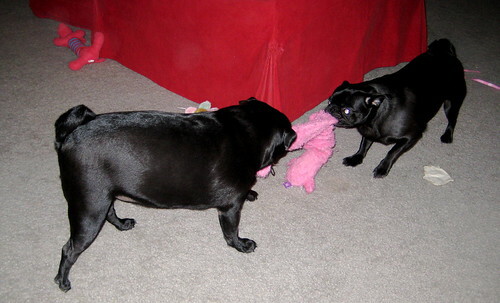 Pug fights can get quite vicisious. The first time you witness it, it can be a little shocking. Oh good, let me know what you find out! Now I am curious! I wonder if I am the only puggle out there that’s a lefty?! WOW! Molly got so …er…plump. Adorable still though! I agree…it’s like having a pug day care! I love it when they play with their toys.